OK, its been more or less an open secret for long that i have a Anushri Programmer in the pipeline. Since the Anushri has more MIDI controlable parameters than the Shruthi i wasn’t able to stuff it into a Shruthi XT like enclosure, so i decided to do the prototypes fitting into a 3HE subrack. To be independent from the firmware this time the controller should be MIDI based. The Drum Machine Programmer containing all ARP and DRUM settings like on the SoftPots of the Anushri + a Button for each drum and a MIDI button to access the settings on startup and that acts as a MIDI Panic Button. The Drum Synthesis Programmer containing the 14 parameters for the drums that aren’t accessible via the Anushris user interface + a button for each drum and a MIDI button. Inside all controllers are built on the same Platform named µMC (Micro MIDI Controller); its made of a standardized PCB, a PicAxe 28x2 Microcontroller that runs at 64MHz allowing minimal latency, a 6N137 Optocoupler for the MIDI Input, a Quartz, a simple 5V 7805 based PSU and a few resistors and caps. Thats it. No additional chips, no multiplexing, no nothing. The unit forwards every received MIDI data to the MIDI output and merges internally the CCs you generate. All CCs are direct representations of the analog setting of the Pot, if you turn the knob it directly outputs the corresponding CC, the only thing you can set from the User Interface is the MIDI channel. The firmware will allow to update the set of CCs for the 14 Pots by MIDI SysEx so you can reconfigure the µMC without the need for programming knowledge or other hardware simply by playing a MIDI file from your sequencer. I have built 2 of these on perfboard as protos, a PCB is in development and yes, ill do Kits (as always complete ones with all parts!). You will have the choice of an EuroRackable frontpanel or an enclusure the depth and heigth of the Anushri and with the width of 1, 2, 3 or 4 Programmers with the same layout as on the EuroRack Modules. You will also be able to get the Bare Board + the PicAxe chip to make your own controllers, the SourceCode is OpenSource and will be available. Any feedback is highly appreciated – the only thing you now might not ask is when its available…. Bare board plus pic!!! Holy funkmeister Frank you rock! Can’t wait for that! Might have to do a pronto board mock up first. By the way, great reading on your Wordpress. It is known! Programmer ! Huzzah ! Given Olivier’s rate, anything over 0.31% of Olivier’s rate is pretty rockin. I should also say, hoping for info on whether a vectornator pcb will be available. For anything Exfilinator related please follow me up to Wordpress, i don’t want to have the MI Forum cluttered with things that have nearly nothing to to with Mutable Instruments Gear…..
this low voltage madness at best! give it to me, the whole thing! Wow, Frank. Who the hell programs the programmer programmer? basically its a blown up version of the Anushris knob jamming feature. You are going to bankrupt me frank. I do the best i can. Its not much, but ill do it anyway…. Just wanted to ask if anyone is seriously interested, i stalled this a bit because i felt there would be not much interest…..
good joke. of course i’m interested. did you do some kind of pcbs or is it more perfboard / pot wiring? If i get enough interest ill do factory made PCBs + Parts Kits; be aware you will need a µMidi Controller Kit and a Programmer Kit for each one of the Programmers Modules (Drum Machine / Drum Synthesis / Synth Modulations / Synth Synthesis ). I’m in for 2 of each. Thanks!! Any updates on the programmer? I would be interested in this. No news on this as i might change the internals a bit…..
Everything drum related plus non-eurorack enclosure interests me! @fcd72 – great work you are doing here, I haven’t settled on Anushri or Shruthi (or maybe even the Doepfer DIY) yet (choices, why must there be so many excellent choices!) but if I go the Mutable way I will definitely be interested in one of your programmer kits. @ChadPMIK: why don’t you go all the way? That is the end goal, which is why the Anushri seems like a good start… a MIDI to CV module alone from Paia is $122… while that does seem a little more advanced than the one you get with Anushri, Anushri has a synth, drums, sequencer/arpeggiator, etc. It seems like the best value for getting started. Looking at the Pic above it must sound like some Drone, Blip, Drop, Filter Zip or just Sine…. 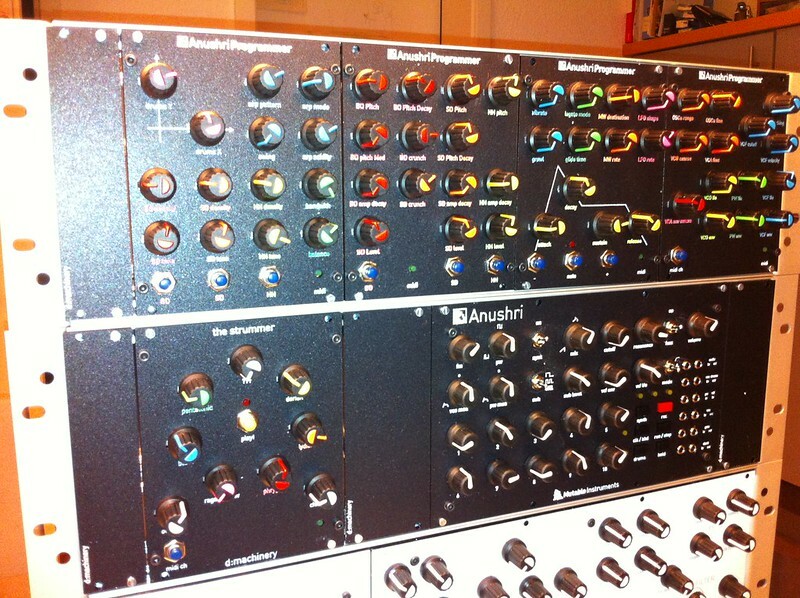 Anushri is a good starter MIDI-CV – use mine a lot for that role with the modular. You have not enough Modules/Patchcords – it further evolves to one single waveform: Sine. I stumbled upon this post and I have to say I am stoked and beyond excited about this project. My question is, is there a waiting list where I can be added to? I would really appreciate it. As you might deduct form the fact that there is no activity in this thread for 2 years this Porject more ore less has passed away…..